The act of confirmation bias is where people seek out data to confirm an incorrect hypothesis whilst ignoring data that will falsify and thus refute the hypothesis. Today we are seeing a lot of confirmation bias relating to the recent Brexit referendum. The Brexit referendum in 2016 resulted not only in victory for the Leave campaign but a lot of confirmation bias from the Remain campaign. 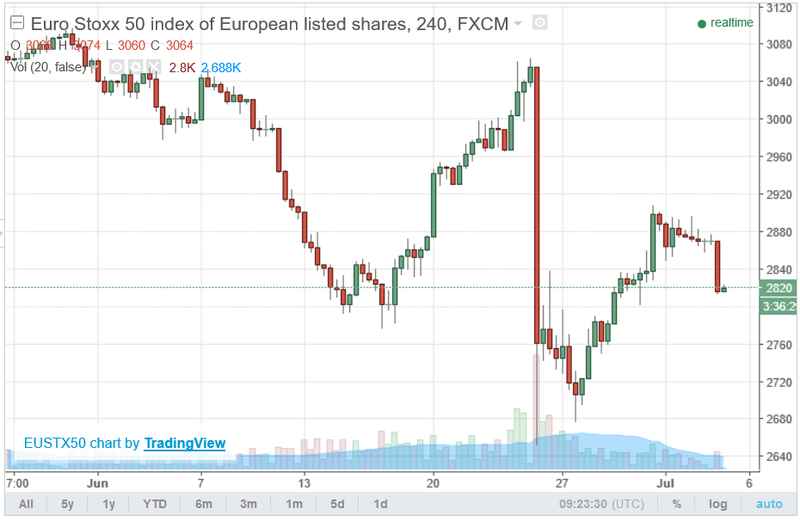 The Remain supporters were quick to point out a downturn in the stockmarket but the FTSE 100 soon recovered. "Ah but!" shout the anti-Brexit supporters. "Look at the FTSE 250. That is more representative of trade with Europe rather than the globalised trading of the FTSE 100." 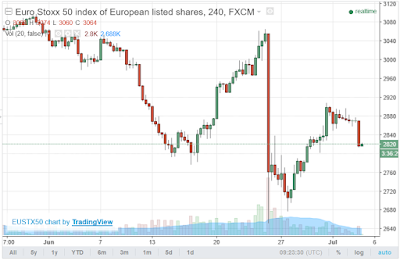 Yes, the FTSE 250 was still down at the time of writing this article but then all markets in Europe were down too as can be seen in the EuroStoxx 50 chart below. After all, Euro companies are not going to be shooting themselves in the foot by refusing to trade with one of the largest economies in the world. These same Remain supporters also pointed out that Sterling "appears" to be in free-fall against some currencies. And yet they fail to notice that all currencies are constantly devaluing against each other. Sometimes it is the Dollar falling, then the Euro, then Sterling, then another. A far better index of currency strength is gold, which has risen against all currencies and not just Sterling, thus demonstrating the weaknesses of all fiat currencies. Actually, Sterling falling against the currencies of our main trading partners is good for business as it makes our exports cheaper. At any other time a devaluation of Sterling would be looked on positively in economic terms but not at this time when it is given a different significance for political purposes. Another attack on a weaker Sterling being good for business is to say that the UK is a net importer. This is just a smoke screen. After all, so too is the United States a net importer as can be seen in the chart below. Without exports the UK would be on its knees. The fact that the UK imports so much can be interpreted in so many ways. For example, overpopulation and the UK not living within its means or the UK has a booming export business requiring raw materials. Just blurting out "the UK is a net importer" is just scaremongering to belittle our exports. And so, on many counts, we see data being used to prove a point that is actually an untruth. Data not being looked at in the whole and just a few elements being picked out to prove a point. Articles from left-wing newspapers and left-wing think-tanks being quoted as unbiased facts. The fact is that the financial system has not been fixed since it was revealed to have been broken in (or long before) 2008. That interest rates are still very low and will probably go even lower. Not just in the UK but throughout the world. We have only to look at Japan to see decades where there have been deflationary periods and constant low interest rates. Brexit was an excuse to let markets find their own way (rather than banks manipulating indices as they have been shown to be) and if the suits can scare people into changing their mind about Brexit then that is just an added bonus. Nothing has been fixed since the crisis of 2008 and there is probably more financial turmoil to come and little of it the fault of the UK. Government debt continues to rise. The world continues to live beyond its means. Bankers continually create new exotics to gamble with in their casino masquerading as a market. The markets love volatility because that increases volume and more volume means more commissions for the bankers. For a banker, a chaotic market and a controlled population can only be good. You must understand the whole picture before using a subset of data to confirm an incorrect hypothesis. Do not start with a conclusion and then fit data to create a false hypothesis. A trader should look on volatility with a positive mind and should not be deviated from opportunities by biased data or biased thought. One person's error is another's opportunity. As Liberace once said, "I cried all the way to the bank."